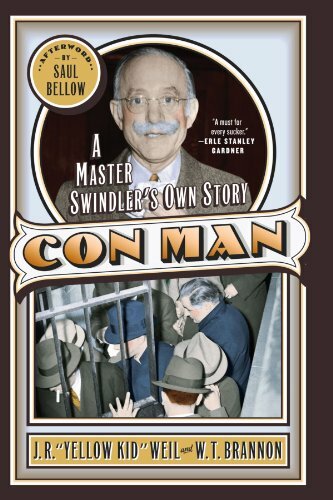 The personal story of Joseph 'Yellow Kid' Weil, originally published in 1948, recounts his dealings as a confidence man who tricked the public out of more than eight million dollars through bogus oil deals, fixed races, phony investment opportunities, counterfeiting schemes, and more. Reprint. The story of Joseph Ã¢ÂÂYellow KidÃ¢ÂÂ Weil, a man who couldÃ¢ÂÂand often didÃ¢ÂÂpull off scams to outshine The Sting. In his long career as a confidence man, Joseph Ã¢ÂÂYellow KidÃ¢ÂÂ Weil swindled the public of more than eight million dollars and established the reputation for robbery and trickery. Always beating the police at their own game, Ã¢ÂÂYellow KidÃ¢ÂÂ used phony oil deals, women, fixed races, and an endless list of other tricks to best an increasingly gullible public. One day, he was Dr. Henri Reuel, a noted geologist who traveled around and told his hosts that he was a representative for a big oil companyÃ¢ÂÂall the while draining them of the cash they gave him to Ã¢ÂÂinvest in fuel.Ã¢ÂÂ The next day, he was director of the Elysium Development Company, promising land to innocent believers while robbing them in recording and abstract fees. Or he was a chemist par excellence who had discovered how to copy dollar bills; promising to increase your fortune, he would multiply your billsÃ¢ÂÂthen take the booty once the police arrived. Originally published in 1948, here is WeilÃ¢ÂÂs true and amazing story, with a smart and witty Afterword by none other than Nobel Laureate Saul Bellow, who profiled Ã¢ÂÂYellow KidÃ¢ÂÂ for The Reporter in 1956. It is undeniable proof that Ã¢ÂÂYellow KidÃ¢ÂÂ was the con man par excellenceÃ¢ÂÂthe virtuoso scam artist, bar none. About: The personal story of Joseph 'Yellow Kid' Weil, originally published in 1948, recounts his dealings as a confidence man who tricked the public out of more than eight million dollars through bogus oil deals, fixed races, phony investment opportunities, counterfeiting schemes, and more.